Still searching for some activities to plug gaps in the schedule on your NZ holiday, or just wanting to stretch your dollars a bit further? These unmissable attractions provide the best bang for your buck – they’re all free of charge! Hot Water Beach (Coromandel) – Visit close to the time of low tide and dig your own personal hot pool on the beach! 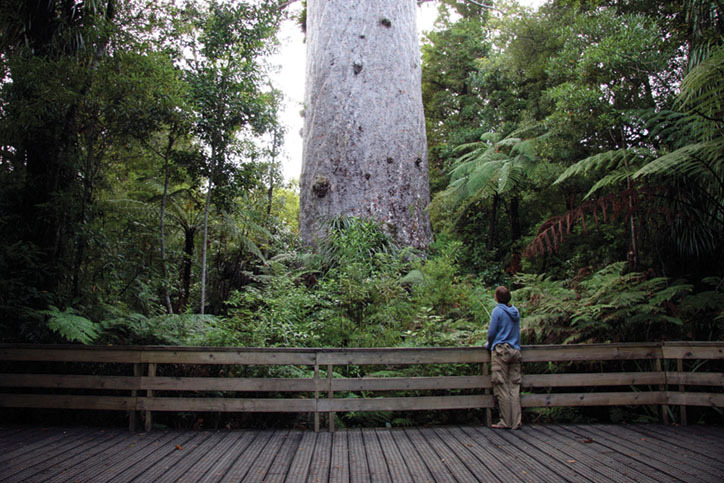 Tāne Mahuta (Northland) – New Zealand’s largest surviving example of the ancient Kāuri tree. 50 metres tall, it’s known for its magical aura. Parnell Rose Gardens (Auckland) – Over 5000 roses create waves of colour in this downtown Auckland park, best seen in Summer or Autumn. Waitakere Ranges (Auckland) – Home to black-sand beaches, native bushland and wildlife, with over 250km of tracks to explore. Snorkelling on Goat Island (Auckland) – Grab a wetsuit and snorkel and check out the amazing range of marine life in this marine reserve… kingfish, snapper and even dolphins! Coastal Walkway (Taranaki) – Pass through city and coastline on this award-winning promenade walk dotted with visual treats. Ruakuri Bushwalk (Waitomo) – An easy walk for all ages, with limestone arches and forest-lined gorges, a real highlight in Waitomo. Spa Park (Taupo) – Relax in the hot thermal springs at this beautifully landscaped park with playgrounds for the kids – a gem. Weta Cave (Wellington) – A Lord of the Rings fan’s dream – and it’s free! Including sculptures, movie props and documentaries. Rere Rock-slide (Gisborne) – NZ’s all-natural water slide! Seriously fun, with great spots for picnic lunches available. Mt. Maunganui (Tauranga) – A steep walk up “the mount” is well worth it for the stunning 360-degree views over the Bay of Plenty. Oriental Bay (Wellington) – Wellington’s coolest beach suburb, perfect for all the family with trendy shops and cafes to explore. The Catlins (Otago & Southland) – Rugged coastal landscapes, varied wildlife and natural rainforests are the hallmarks of this beautiful area. Bungy Watch at Kawarau Gorge (Queenstown) – Not feeling up to a bungy? Watch the jumpers from the famous Kawarau Bridge or café instead. Milford Sound (Fiordland) – A breathtaking drive in and views of this iconic fiord are available as part of a full day road trip. 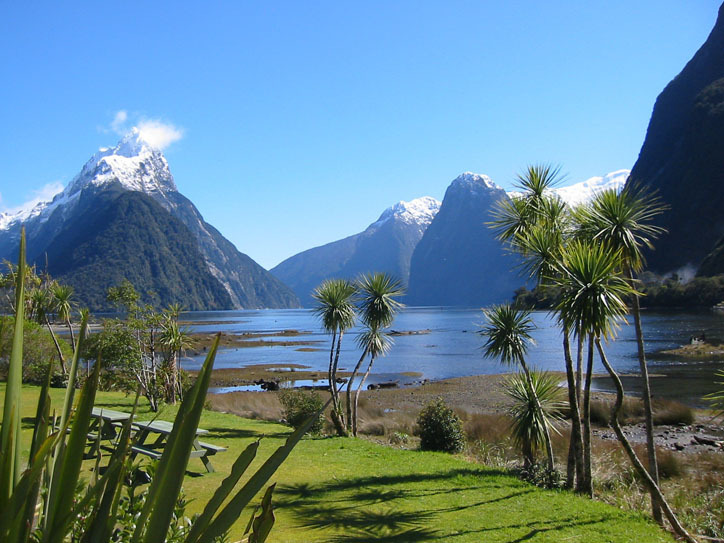 Te Anau (Southland) – The gateway to Milford Sound, with plentiful restaurants and walking tracks. 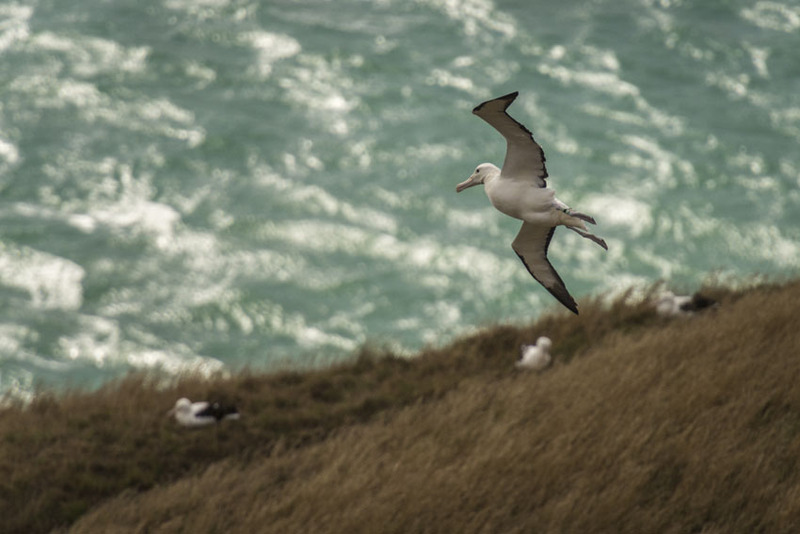 Albatross Colony (Dunedin) – A “must-see” according to Sir David Attenborough, majestic birds with a wingspan of up to 3 metres! Blue Pools (Wanaka) – An easy walk gets you to crystal clear pools of striking Sapphire coloured water. Stargazing (Tekapo) – Enjoy a stargazing experience that’s almost unmatched, as part of the Dark Sky Preserve. Climb Queenstown Hill (Queenstown) – An intermediate level hill track provides epic views over Queenstown, the Remarkables and lake Wakatipu. Hiking Trails (Mt. Cook) – Hike one of the many trails around New Zealand’s tallest mountain – Mt Cook. Hinewai Nature Reserve (Banks Peninsula) – A beautifully presented series of walking tracks through native bush with waterfalls and rare tree varieties. Tunnel Beach Walkway (Dunedin) – Keep an eye out for fossils in the rocks as you walk this track with epic sandstone formations and sandy trails. 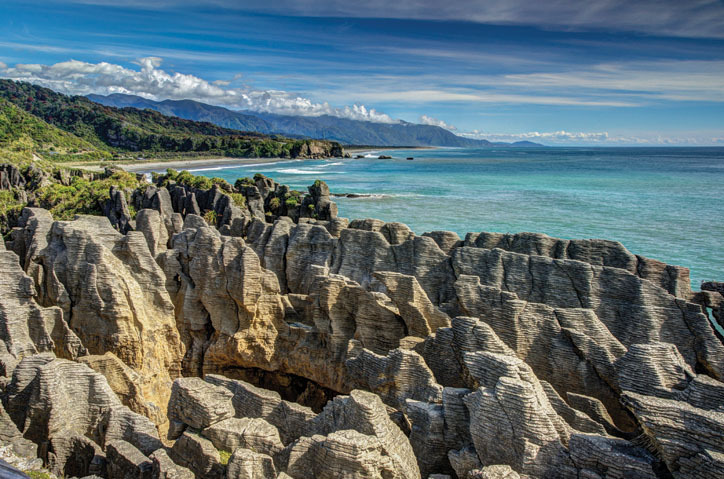 Pancake Rocks (West Coast) – A must-do on the rugged West Coast, these limestone rock formations really do look like a stack of pancakes! See New Zealand and experience attractions that won’t break your budget.